Grandfather-father-son backup is the one of most popular backup schemes, allowing saving data into the two different places with three repeating frequencies. 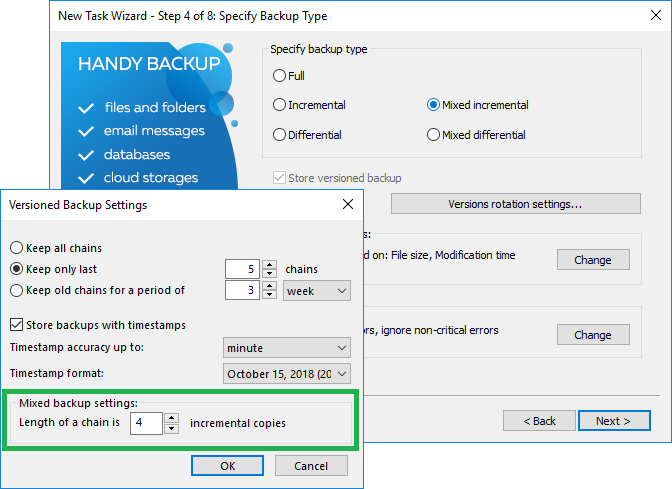 Handy Backup allows imitating GFS backup using the mixed full/differential backup as "father and son", and another "grandfather" full backup. The "son" – incremental backup (or differential backup) to the same storage as "father". 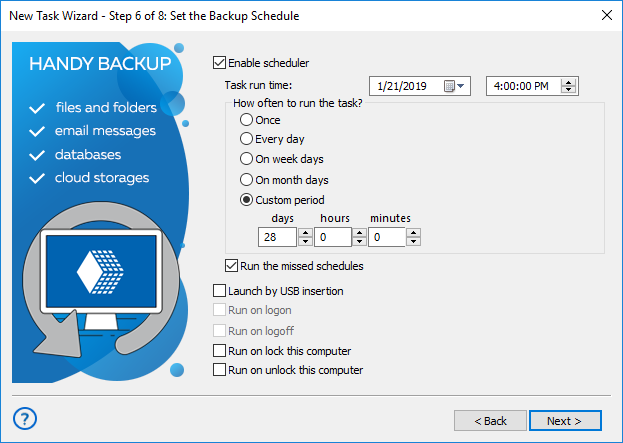 To simulate this backup scheme, Handy Backup uses the two separate tasks: one to perform a scheduled mixed backup (i.e. 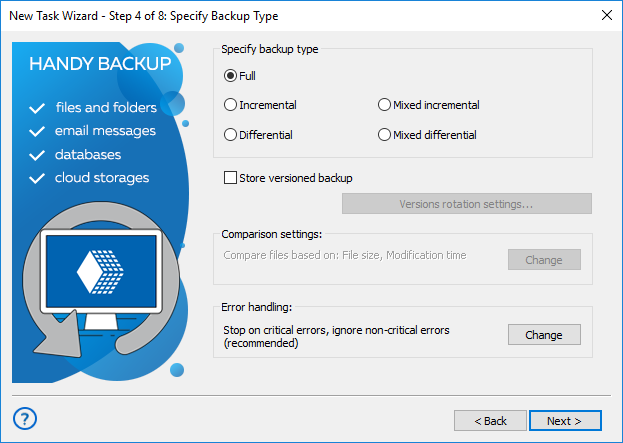 a cycle of full backup followed by some preset quantity of differential backups, repeating at a cycle) as both "father" and "son", and another full backup task as "grandfather". 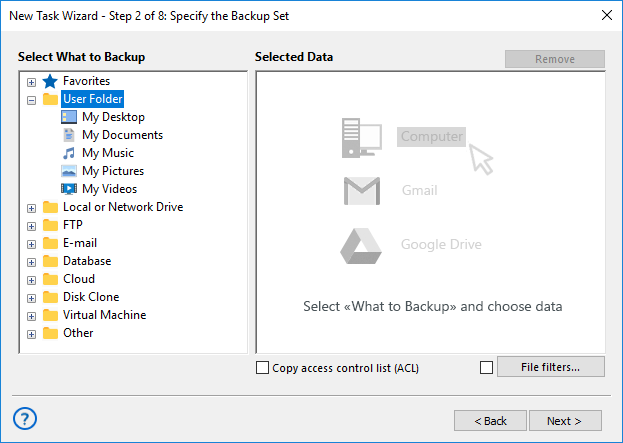 You can save both your “elder” and “lesser” backups to many storage types, including physically or digitally secured data vaults: local drives, external USB disks, NAS/SAN units, data servers, FTP, SFTP and FTPS storage or clouds like S3-driven, Google Drive, Dropbox, OneDrive (for Business, too) etc. You can imitate the grandfather father son backup with uneven or non-standard intervals, like making different backup stages repeating in minutes, in weekdays or in months. Handy Backup allows very flexible scheduling for each task, allowing integrating your GFS backup into more complex strategies. With Handy Backup, you can divide your complex datasets into different types to apply grandfather father son backup scheme to all these data or only to some components of an information array. Divide and merge, mirror and clone, do different tasks on different network servers – all in one solution! How to Set Up Grandfather Father Son Scheme in Handy Backup? To imitate GFS backup scheme with Handy Backup, you can use the sequence of actions provided by the next instruction. In this example, we are assuming that you will apply a GFS backup scheme to "My Documents", with FTP storage for "father" and "son", and a Google Drive account as "grandfather". Firstly, open Handy Backup. Call a new task wizard by clicking the "New task" button on the main window, or by calling for a main or context menu. (Alternatively, you can just press Ctrl+N.) Select the backup task type on the Step 1. On the Step 2, select the "User Folders" plug-in as backup data source in the "Local or network file" group on the left pane. Click the ">>" button, or double-click on the plug-in name. You will see the plug-in window. Mark the checkbox against "My Documents" on the right pane. Click OK and then click the "Next" button to go to the Step 3. On the Step 3 window, click on the "FTP" on the left pane, and then double-click on the "Create a connection…" string on the right pane, to make an access to your FTP storage. In the dialog window that will appear, set up all connection parameters to your FTP server. Click OK. Now double-click on the FTP connection name that you just created on the right pane. 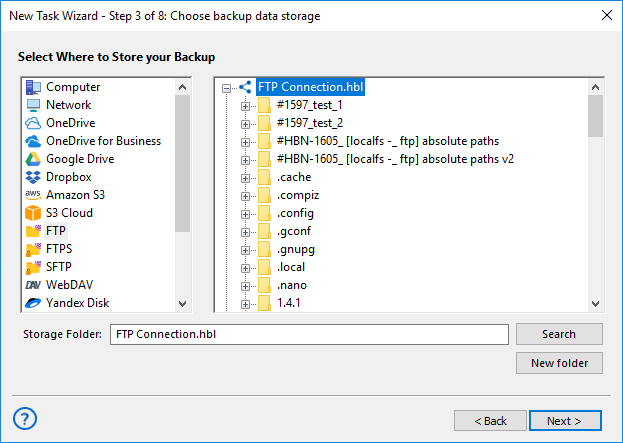 Select a particular storage (folder) on an FTP server to place your backup. Click OK.
Now click "Next" and go to the Step 4. Here, select the "Mixed incremental backup" option. Click on the "Versions rotation settings". You will see the new dialog window. In this dialog, select "Keep only last" and set up keeping only the last 4 incremental copies next to this option. Click OK.
Click "Next" and go to the Step 5. You may choose data encryption and compression on this step. Regardless of these options, click "Next". Now you are on the Step 6, and here you will schedule your task. On the "Start" date field, select the next Monday to run this task at first as "father" backup. 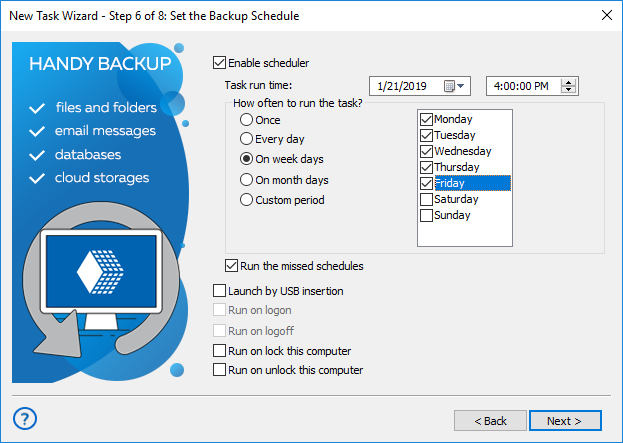 Select the "On week day" option, and mark the workdays of the week to make "son" backups. We are also recommending marking the "Run the missed schedules" options for this case. It will guarantee the backup consistency. After finishing scheduling, click "Next" to continue. The Step 7 is for making external software calls; if you do not need it, go to the final Step 8. On the final step, uncheck the option of immediate start to a task, and give your task a name (as an example, "FatherSonOne"). You will complete the task creation! The Small Server edition can organize analogs of grandfather father son rotation schemes for any types of data and storages – just out of the box! On the Step 3, select "Google Drive" as the backup destination. You may create a connection to your Google Drive account, as for FTP server in the previous example. Click the "Connect to Google Drive" button, and then provide all data for your account in the browser window. Do not forget to allow Handy Backup using your Google Drive! On the Step 4, select full backup. Mark the option "Store versioned backups". Click "Versions rotation settings". On the dialog window, allow to save as many (or as old) copies of your "grandfather" backup as your wish. Return to the new task wizard and go next to the Step 6. Here, enable scheduling and repeating, and select the last Friday of the month in the "Start" date field. Select a repeating option of "Custom" period of the 28 days 0 hours 0 minutes, to ensure that your "grandfather" backup will take place every fourth Friday. Check the "Run the missed schedules" option, to be ensured that your "grandfather" backup sequence will also be as consistent as "father" and "son". Complete the task creation as described in the previous part. Give your task a name related to the "father-son" part (e.g., "GrandfatherOne"). Check also that you will not run this task automatically just after creating it! Well done! You have tuned up the GFS backup schema using Handy Backup! Happy job! With Handy Backup, you can copy classic "grandfather father son" backup schemes without any limitations! Experience this technique by downloading a 30-day free trial edition of the program, with all functions and plug-ins available!